The LogCom Group consists of three companies LogCom Systems, Shadforth Log Scaling, and Frontier Log Scaling. LogCom specializes in Harvest Billing System (HBS) compliant scaled log data collection, processing and reporting for the BC Forest industry. Shadforth LogCom specializes in Harvest Billing System (HBS) compliant scaled log data collection, processing and reporting for the BC Forest industry. Whether its Metric and/or Scribner scaling, or quality control in the bush; at Frontier we pride ourselves on the quality of service that we provide our clients. LogCom has been developing data input systems for more than 40 years. We were originally formed in order to meet the demands of the forest industry to convert collected log scale data into a digital format that could be used by both the industries and the government. Our in-house systems have changed over the years, in order to meet changing customer’s needs, but we have always been able to maintain our guarantee of 99.9% accuracy rate due to the core design that our systems are based upon and due to our commitment to complete customer satisfaction. This level of service to our customers has made us the best in our business. As we have grown over the years, we have expanded the types of services that we offer, increased our clientele and branched out to other industries outside of forestry. Throughout all of this one thing has remained the same; our goal of excellence. LogCom’s service includes receiving and validating data collected electronically. 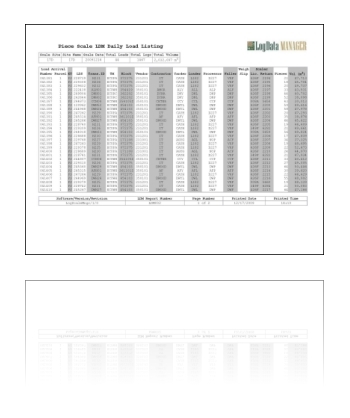 From this data, we generate reports structured to meet client-based specifications. These reports are then forwarded to you either by fax, FTP or email. Each client has their own validation criteria. LogCom has the ability to customize these edits/validations to reflect your standard business and/or changing requirements. As reporting requirements can vary as much as our clients, LogCom offers a wide variety of stock reports, or we can design custom reports to meet each unique clients needs. As our clients increasingly have enterprise systems that store their data, we can expand our reporting to include an electronic export. Once your data is successfully processed, we can export it into an electronic file which you could easily integrate into your own internal data systems or we can design an interface to have your data directly imported.